The town of Dennis is bounded by Cape Cod Bay on the north and Nantucket Sound to the south. West Dennis—one of Dennis’s five villages—is in the southwestern part of the town, separated from South Yarmouth by the Bass River. The Dennis side of the river once had saltworks and facilities for building small vessels, and many West Dennis residents were involved in fishing and coastal trade. For some years before a lighthouse was built near the mouth of the Bass River in 1855, it's said that a West Dennis resident, Warren Crowell, aided local navigation by keeping a lantern burning in the attic window of his house at Wrinkle Point. Local ship captains each donated 25 cents monthly so that Crowell could buy the oil he needed to keep the lantern lit. As traffic in the area increased, so did the demand for a lighthouse. Congress appropriated $4,000 for a lighthouse on September 28, 1850. After more debate over the need for a lighthouse, the amount was reappropriated in 1853. A site near a breakwater at the mouth of the river was soon selected. The land for the light station was purchased from George W. Richardson in March 1854. Oxen hauled building materials across the local marshes. The light went into service on April 30, 1855, with a fifth-order Fresnel lens displaying a fixed white light. The lighthouse consisted of a two-story, wood-frame dwelling with the lantern mounted on the roof. Many sources claim that Warren Crowell, the same man who kept a light in his window as an aid to mariners before the lighthouse, was the first keeper. According to payroll records in the National Archives, however, the first keeper was James Chase, who served until 1861. His starting salary was $350 per year. It's possible that Crowell served as an unofficial assistant, and he later became the official keeper. The house stood tall and solid and foursquare, quite a distance back from the edge of the water. In those days the beach presented a busy scene. . . . It was lined with fishing dories, moored or drawn up on the sand, and great piles of long, slender weir poles were stacked here and there. . . . Atop the sand dunes straggled an uneven line of small, weather-beaten fish shanties where their owners could store their gear and warm themselves about battered little stoves in inclement weather. When we went to the beach as children we never tired of wandering along the shore, watching the fishermen mending their nets, setting out for their weirs, or bringing in a shining catch. . . . The lighthouse itself always dominated the beach with its purpose and significance. James Chase's granddaughter Carrie May Sheridan later recalled seeing ships anchored offshore while friends and families waited on the West Dennis Beach for the passengers’ arrival. “Horse-drawn wagons drove into the shallow water’s edge to take them ashore,” she said. Zelotes Wixon of Dennis became keeper in July 1861. Wixon, who like Chase was paid $350 yearly, complained that when he arrived at the lighthouse expecting to be trained, Chase was not cooperative. “[He] refused me all access to the light until the first day of August though I several times requested permission to look at it and examine the same in order to fit me for my position and the proper discharge of my duties,” wrote Wixon. 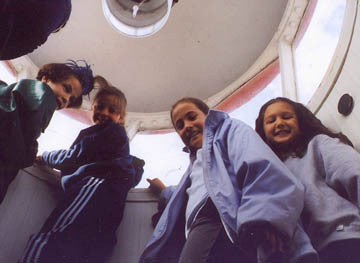 ​Wixon also reported that the outgoing keeper was apparently adulterating the oil used in the lighthouse. Warren Crowell, who had been wounded and taken prisoner in Virginia during the Civil War, became keeper in 1869 and remained in the position for 11 years. Then, on August 1, 1880, the lighthouse was discontinued after the lighting of Stage Harbor Light a few miles to the east, in Chatham. ​The property was sold at auction. A newspaper reported that Warren Crowell returned "to his former residence where he is having a barn built." William Garfield, a local mariner who was captain of the schooner O. D. Witherall, was so unhappy about the light being discontinued that he wrote to his distant relative, the newly elected President James Garfield. "Our harbor is one of the best there is in the Vineyard Sound," he wrote. "All vessels come in here in bad weather and no light makes it bad for large vessels. When you git [sic] to Washington and git everything working, well then, we shall write you and see if you can do anything for the Light House." On July 1, 1881, Captain Garfield and his two daughters were invited to have dinner with the president. After dinner, the president informed that captain that on that very night, the light was being reinstated by executive order. Capt. Samuel Adams Peak of Hyannis became keeper, remaining until his death in 1906. Captain Peak had gone to sea as a boy and served as master of two barks before becoming a lighthouse keeper. His father and grandfather had also served as lightkeepers in the Hyannis area. The government deemed the lighthouse unnecessary after the advent of the Cape Cod Canal. Thanks to the efforts of Congressman Thomas C. Thacher, a new automatic light was established on the Bass River west jetty at the entrance to the river. The lighthouse was extinguished on June 15, 1914, and its Fresnel lens was removed. Keeper Eastman was transferred to Ned’s Point Light in Mattapoisett, Massachusetts. The property was soon sold at auction. Harry K. Noyes—of the Noyes Buick Company in Boston—used it as a summer residence for a while. Noyes expanded the main house and added several new buildings. After Noyes’s death, the property was unoccupied for about five years, until 1938, when it was bought by State Senator Everett Stone and his wife, Gladys, for $22,000. 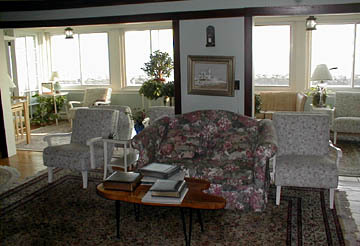 The Stones began to have overnight guests at the lighthouse, and their hospitality became so popular that they soon opened it to the public as the Lighthouse Inn. In 1939 a night’s stay for two—including three meals— cost $5. Everett and Gladys Stone’s son Bob became the first head of the food service for the inn. Bob Stone hired three waitresses from Wheaton College. One of them was Mary Packard of Brockton, Massachusetts. Bob and Mary married in 1942. Mary Stone later recalled that during World War II, American planes bombed the rocks near the inn for practice. The guests would gather on the beach and cheer the show. A hurricane battered the property in 1944, and two more did considerable damage in 1954. Hurricane Bob in 1991 sent seawater cascading through the windows of a downstairs lounge and out through the doors on the opposite side. For years Greg Stone found it difficult to return to the inn when coming back from Nantucket or Martha’s Vineyard. The area’s small navigation lights blended with other lights on the shore. He convinced the Coast Guard that a relighted Bass River Lighthouse would provide a needed service to local boaters. The light, officially designated the West Dennis Light, now operates each summer. The old 1855 lantern atop the inn got a much-needed overhaul in March 2002. Marty Nally and Clem Fraize of the Campbell Construction Group of Beverly, Massachusetts, did the job, which included the installation of six new panes of heat-resistant glass. 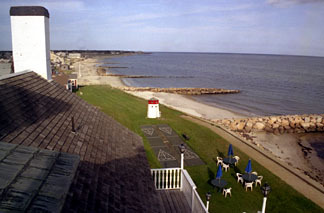 The Lighthouse Inn features 700 feet of private beach, with 61 rooms and cottages (with working fireplaces), tennis courts, cocktail lounge and a waterfront dining room offering a five-course dinner every evening. The inn also has a special children's program in the summer, with a children's director who plans and supervises activities for the children of guests. If you stay at the inn, you might also be able to arrange a tour of the lighthouse and lantern room. For more information, contact The Lighthouse Inn.